Nurse and cultivate some of the qualities of leadership present within you with the help of this book called The Leader Who Had No Title written by Robin Sharma. The Leader Who Had No Title is a book by the well known and widely read author Robin Sharma. This book elaborates the various ways to ignite the qualities of a leader present within every individual with some of the remarkable influences, innovations, and performances criteria that are required in a person’s professional as well as personal life. This book will help its readers to plan and work like a trend-setter in their respective work arenas, to make the most out of lucrative opportunities in the times of altering issues. The secrets of success behind the life of rich and successful people, as described in this book, will imbibe the minds of the readers with strategic plans required for customer handling and team building. The author manoeuvres trenchant techniques to make the readers strong, both mentally and physically, to create an invincible mindset to overcome stress, and release balanced vigour to achieve success in today’s world. 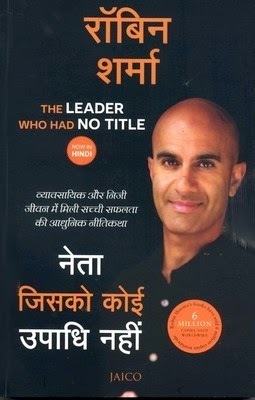 This edition of this book is a Hindi translation of Robin Sharma’s English book The Leader Who Had No Title. Irrespective of the class or position that an individual is working as, this book is an astonishing tonic for those individuals who believe in the power of leadership that flames within them. Robin Sharma is a renowned author, speaker, expert of personal management and a leadership icon. Some of his leading books are The Lead Without A Title Manifesto, Family Wisdom From The Monk Who Sold His Ferrari, Who Will Cry When You Die?, Daily Inspiration from The Monk Who Sold His Ferrari, The Saint The Surfer And The CEO, Discover Your Destiny With The Monk Who Sold His Ferrari, Leadership Wisdom From The Monk Who Sold His Ferrari, The Monk Who Sold His Ferrari, The Greatness Guide Book 2: 101 Lessons For Success and Happiness, and The Greatness Guide respectively. Robin Sharma holds the nationality of Canada and comes from a very traditional Indian family. He acquired double degree in the discipline of Law and also holds an MA degree in the same from the esteemed Dalhousie Law School. He self published his first book that was edited by his mother, after retiring from his professional career as a lawyer. He is the Chief Visionary Officer, CEO and founder of the Sharma Leadership International Inc. In the year 2009, he was the recipient of the Brand Laureate Brand Personality Award.